During this week our office handed over NBE HQ building at Misr El-Gdeda (ElBaron-center), and the building started working at it’s full capacity. On Sunday, April 3rd, 2016. On Wednesday, March 16th, 2016. On Wednesdsay, March 9th, 2016. On Tuesday, October 13th, 2015. On Monday, April 15th. 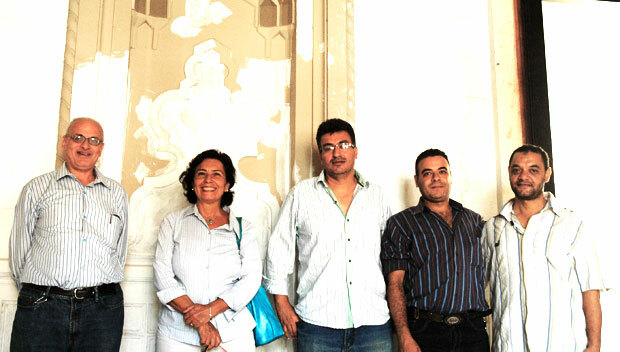 2013, The higher state minister of antiquities Dr. Mohamed Ibrahim together with the Minya Governor Dr. Mostafa Eissa, the German delegation, Prof. Dalila ElKerdany and representatives of the consultant visited the construction site of Akhnaton Museum. The book was published in December 2011. Mimar congratulates all the brave Egyptian people for their freedom and looks forward a new age of democracy, justice, and everything good. Viva Free Egypt. Mimar congratulates the Egyptian and Islamic Nation for the Birthday of the Prophet; Muhammed, Tuesday, Rabe’ 12, Feb. 15.